N.E.D. University of Engineering and Technology (NEDUET) has been ranked among the world's top 200 universities for "impact" by Times Higher Education. The institution located in Pakistan's largest city of Karachi is ranked among 101-200 in the world. 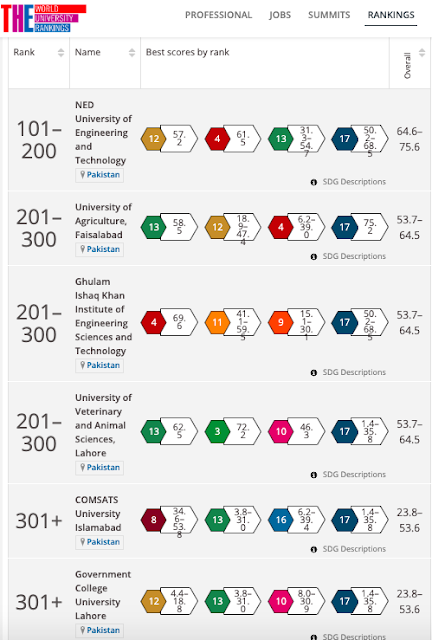 NEDUET also tops the rankings for impact among Pakistani universities included in THE 2019 rankings. The Times Higher Education (THE) University Impact Rankings assess universities against the United Nations’ Sustainable Development Goals (SDGs) to provide "comprehensive and balanced comparisons across three broad areas: research, outreach, and stewardship". Among other institutions of higher learning, the University of Agriculture Faisalabad (UAF), Ghulam Ishaq Khan (GIK) Institute of Technology and University of Veterinary Sciences Lahore are ranked among 200-300 while COMSATS and Government College University Lahore are among 301+. Of the 17 UN SDGs, THE has evaluated university performance on 11 of them in its first edition of the ranking: SDG 3 – Good health and well-being SDG 4 – Quality education SDG 5 – Gender equality SDG 8 – Decent work and economic growth SDG 9 – Industry, innovation, and infrastructure SDG 10 – Reduced inequalities SDG 11 – Sustainable cities and communities SDG 12 – Responsible consumption and production SDG 13 – Climate action SDG 16 – Peace, justice and strong institutions SDG 17 – Partnerships for the goals. 1. Research metrics are derived from data supplied by Elsevier. For each SDG, a specific query has been created that narrows the scope of the metric to papers relevant to that SDG. As with the World University Rankings, we are using a five-year window between 2013 and 2017. The only exception is the metric on patents that cite research under SDG 9, which relates to the timeframe in which the patents were published rather than the timeframe of the research itself. The metrics chosen for the bibliometrics differ by SDG and there are always at least two bibliometric measures used. 2. Continuous metrics measure contributions to impact that vary continually across a range – for example, the number of graduates with a health-related degree. These are usually normalized to the size of the institution. When we ask about policies and initiatives – for example, the existence of mentoring programs – our metrics require universities to provide the evidence to support their claims. In these cases we give credit for the evidence, and for the evidence being public. These metrics are not usually size normalized. Evidence is evaluated against a set of criteria and decisions are cross validated where there is uncertainty. Evidence is not required to be exhaustive – we are looking for examples that demonstrate best practice at the institutions concerned. 3. Timeframe Unless otherwise stated, the data used refer to the closest academic year to January to December 2017. Pakistan ranks 51, above Italy (60), Russia (72), Turkey(94) and Brazil (124) among 140 countries.